1891-1894, replacing iron church. By Col E M Bruce Vaughan, architect, who lived in the parish, and later donated the stained glass in E window in memory of his sister (1906). The building shows influence of Bodley's nearby St German's. Builder Messrs Burton & Co, Cardiff. Opened 15 June 1894. Some restoration following fire in 1925, by Willmot & Smith, architects, including tiling and marble steps to chancel, altar, organ, and War Memorial rood screen. The reredos (by J B L Tolhurst, and Christopher Webb) dates from 1925. Large church in late C13 Gothic style. Pink grey Swelldon stone, bathstone dressings, slate roofs. Tall NE porch tower with stone spire, tall clerestorey, and apsidal nave, low lean-to aisles, NW porch. Nave elevation has 10 clerestorey lancets in broader arches, broader aisle windows of 2-cusped lights with quatrefoil heads. Apsidal E end with lancets and shallow ambulatory (sculpted heads in roundels), transept-like organ chamber to S. NE tower has stone broach spire with lucarnes, stepped buttresses, louvred 2-light bell-stage windows with geometrical tracery, smaller windows below). Gothic archway to porch. NW porch has half-timbered gable with bargeboards, Gothic doorway with fleurons, simple boarded doors. Reliefs of censer-swinging angels to spandrels. W front of 3 bays with outer stone buttresses stepped and gabled flanking narrower pair of buttresses; 3 tall 2-light windows with Geometrical tracery (smaller 2-light window above to centre). Bathstone faced. Arch-braced roof with cusped wind braces, and wall-shafts. 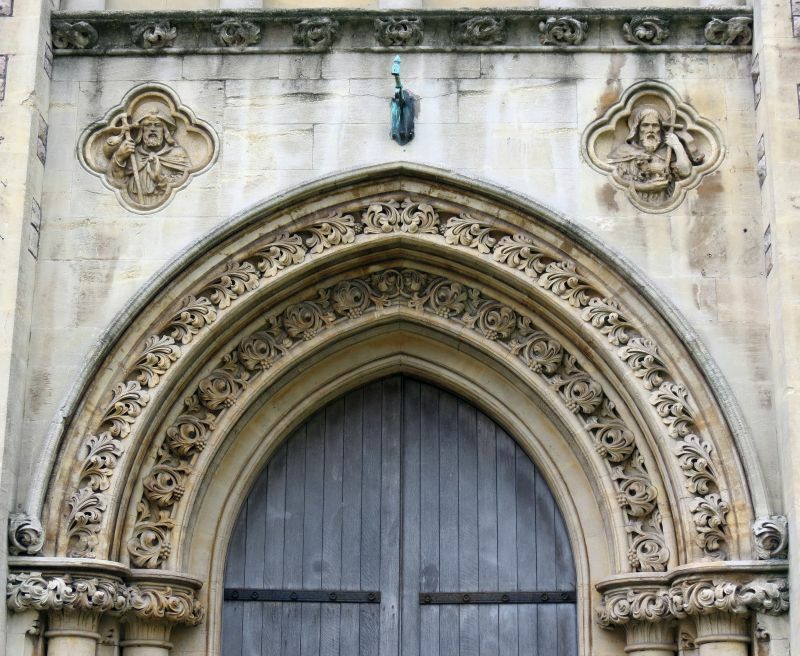 Five bay nave, broad arches (2 clerestorey windows per bay), alternating round and octagonal shafts, stiff-leaf capitals, arcade hoodmoulds with rich floral stops. Marble steps to apsidal chancel, high wide chancel arch. Wooden Perpendicular style screen with rood, plain arches to narrow ambulatory. Reredos, carved gilt, painted with statues of The Lord, St James, John the Baptist and Welsh Saints. Chancel lancets with stained glass of The Lord and Welsh Saints. Very fine octagonal polychrome pulpit (1892) with figures of famous preachers. Listed as "the masterpiece of E M Bruce Vaughan", whose finely composed tower and spire is a key feature on the Newport Road approach to the city centre. Situated at the junction of The Parade with East Grove.